Although the book does not include a diet or eating plan, by increasing the awareness of your eating habits and developing a positive self esteem, Grieve says that you will naturally gravitate towards the diet and exercise choices that will promote weight loss. Grieve says that diets are not the answer because invariably once you stop the diet you start to gain weight again. Instead of offering another diet plan her program teaches you how to reprogram yourself into “thin thinking”. This will allow you to stop yo-yo dieting forever by addressing the reasons why you overeat in the first place. It can also be used as a maintenance plan to help you stay at your ideal weight. This program can be used in conjunction with the dietary plan of your choice and doesn’t require dieters to adhere to any specific diet guidelines. The emphasis is on developing a positive attitude, building self-esteem, facing your fears and identifying other factors that may be influencing your ability to lose weight. Why Are You Weighting also offers a 15-week coaching plan where up to five people meet with her on the phone via a conference call once per week. The program emphasizes the psychological factors involved in successful weight gain and does not include a list of recommended foods. This self esteem boosting program does not include a sample meal plan. This book concentrates on the psychological factors involved in weight gain and does not offer exercise recommendations. Why Are You Weighting? It’s Not The Food That’s Making You Fat! is available in paperback format for $21.95. e-Book and audio book versions are also available. May help dieters to overcome compulsive eating and yo-yo dieting. 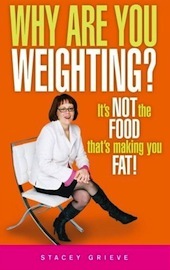 Addresses the emotional aspects of weight gain and dieting. Can be used with your choice of diet plan. Does not include food suggestions or a meal plan. Will not appeal to dieters where emotional eating is not the major cause of weight gain. Why Are You Weighting? helps dieters to identify the emotional and mental factors that may be having a negative effect on the ability to lose weight and keep it off focusing on boosting self esteem. It does not include a diet or exercise program but can be used in conjunction with any healthy eating plan.